What is a pedal assist electric bike? What is a Speed Pedelec? How fast can electric bike go? Can i ride an electric bike without a licence? We receive a lot of questions surrounding electric bikes, especially those that go 30mph. We’ve answered as many questions as we can below. In short, yes they can be. Certainly they get you up to speed a lot quicker than pedalling, but they will have a top speed they stop assisting you at. Electric Bikes, or EAPCs (Electrically Assisted Pedal Bicycles) assist the rider in reaching 15.5 or 28mph, depending on the motor size. They are quicker to reach these speeds, but still require pedal power to get going. You can exceed these speeds, but your legs will need to do some work. In real world terms, pedal assist bikes will only give you assistance when you pedal. If you are going up a hill, you gain a lot of help. If you are not pedalling at all, you recieve none. The electric motor therefore will not keep your bike moving for you, but the effort required to do so will be greatly reduced. If you're looking for an electric bike that does 28mph, then take a look at our Stromer range. Hugely popular for commuting, they have won many awards for their build quality and huge acceleration. Hand built in Switzerland, for many they have replaced the car for commuting and gained a huge amount of prestige within the eBike community. Remember, all of our bikes are delivered fully assembled for free and we offer at home support. Pedelec is a shortened term derived from the phrase “pedal electric cycle”. They are also known as EAPCs. 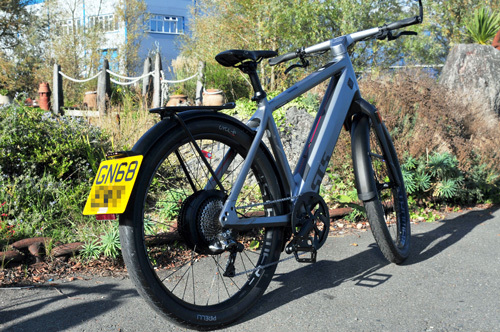 In the early days of electric bikes coming onto the market, the term Pedelec would differentiate a bike from “Twist and Go” bikes which would not need any pedal assistance. However, these have been less legally supported in recent years leaving Pedelecs, EAPCs and Electric bikes to mean roughly the same thing. Speed Pedelecs are a certain category of bike that assist the rider up to 28mph using a more powerful, usually 500W, motor. Due to their increased speed, registration with the DVLA is required and they should be treated as a light moped. Often manufacturers include licence plate mounts, mirrors and horns to comply with L1e-B classification. The bike must be taxed (which is free due to zero emissions) and a moped helmet worn at all times. There are highly rated moped helmets that look similar to traditional bicycle helmets coming onto the market, but it's important to have something that can take the impact at 28mph if the worse should happen! Equally, due to the speed assistance, they cannot be ridden in dedicated cycle lanes. Although this can be off-putting for the commute, on a speed pedelec you will often be going at the same speed - if not faster - than cars and other traffic. The level of safety required is therefore sensible as you will not have the same protection that a car offers. The average speed of UK city traffic in 2017 was just 6mph - a speed pedelec could seriously speed up your commute! All bikes that Urban Ebikes sell are delivered fully registered for you and ready to ride. 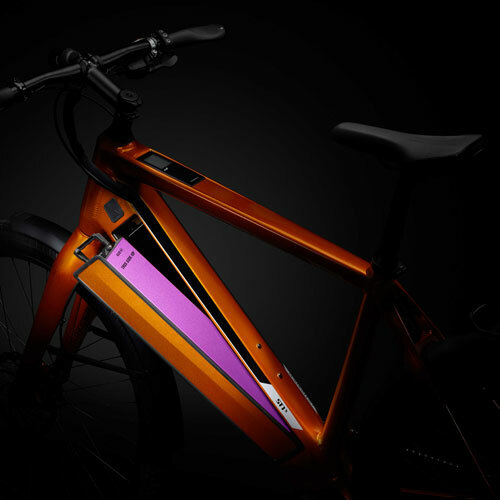 Some electric bikes have more powerful motors that enable them to assist with pedalling up to higher speeds of 28mph (compared to the usual 15.5mph). These are often used for commuting longer distances and can only be used on the roads. You can see all of the bikes we carry that have this higher speed rating of Speed Pedelec. The most popular and well respected are the Stromer range. These are Swiss made high quality bikes able to achieve high speeds easily but safely. We also are seeing Dutch brands like QWIC offer Speed variants on their usual range, with beefier motors pushing them into this category. Usually these are fitted with powerful hydraulic brakes, higher quality tyres and integrated lights, horn, mirrors and number plate mounts to ensure full conformity to DVLA standards. If you are considering a higher speed electric bike, be prepared to spend a bit more money for the added safety. Any cheaper brands or conversion kits will not offer the same level of quality and safety that more expensive models do. You’re effectively replacing a car or motorbike with a bicycle, and should be taken very seriously. Using kits to boost speeds without registration is both dangerous and illegal. Most electric bikes will assist you up to 15.5mph as this is the legal limit. Beyond this, they fall into moped territory and like a S-Pedelec will require registration and tax. Most of our electric bikes then are either limited to 15.5mph or 28mph. However, we are starting to see electric motorbikes coming out that are capable of 30mph and above. What’s the fastest electric bike? Due to their speed restrictions in the UK, the fastest electric bikes will reach 28mph. While some eBikes may go faster than this, they are illegal and not safe for road use. This all depends on the size of the battery. Some cheaper bikes will only have short ranges of under 30 miles. However, most quality ebikes have a range of between 50 and up to as much as 110 miles range without requiring charging. Some may even include regenerative braking technology which can recharge the battery as you ride. If you do run out of battery on your ebike, then you can naturally still use it. However it will become more difficult to pedal due to the extra weight of the battery and motor. Thankfully the advances in battery technology in the past few years have meant lighter batteries and longer ranges. An average commute of 10 miles a day may mean charging your bike just once or twice a week. Removable batteries are a huge help in this regard as you can simply plug them in to charge while at work. For most riders, the bikes have more than enough range for several journeys unless you’re really pushing the limits and doing a 60 mile bike ride in a day. If you’d like to trade your older bike in for a newer one with more range, check out our trade in scheme. Sadly the presence of a battery does make electric bikes heavier than non-assisted bikes. However, they are not all huge behemoths! If you have an Electric assist bike then you don’t need a licence at all. However, if you are on any vehicle that has a motor without pedals, or can go above 15.5mph with pedals, then you will require a CBT licence and the vehicle needs to be registered with the DVLA. For full licencing information, please see our electric bike licence page.